Well I’ve been on Duloxetine for a little over a week now and the withdrawal effects from the Citalopram have finally worn off. Now I’m getting to know my new normal on the Duloxetine. Obviously, it’s going to take a few more weeks before everything settles but already there is a difference in me. I’m feeling brighter and more positive in myself even though I am incredibly tired. 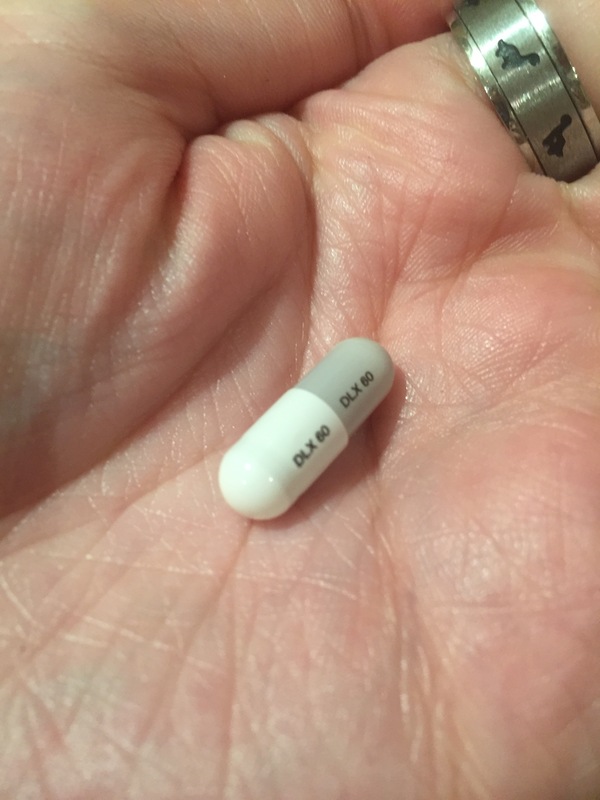 In fact, I spent most of the first few days on Duloxetine fast asleep – my body finally rebelled against the stress of the last couple of weeks and shut itself down. I’m still tired now but it’s getting better and noticeably I am feeling mentally bright enough to get things done before giving in to the tiredness. Before, even the smallest task like emptying the dishwasher felt like too much and I’d just cry and go to sleep, letting it all pile up and making me feel worse. Now I will sort the dishwasher and then let myself have a half hour nap before getting on and doing something else. It’s not perfect, but it is better and hopefully it’s going to keep improving and by the end I won’t need to nap my way through every day! Two side effects I have noticed are muscle spasms (mostly in my legs) and an increased resting heart rate. I have a Fitbit that monitors my heart rate during the day so I would have noticed the increased rate eventually when checking my stats but even without it I am very aware of it. It feels like I’ve just been for a jog – nothing too hard, just a light trot over a short distance – almost all the time. I can feel it in my chest and often hear it pounding in my ears too. I’m getting used to it now but at first it made me nervous because it reminded me of the start of an anxiety attack. The muscle spasms are a bit annoying but not too bad. Just a little frustrating when I’m trying to get to sleep! Anxiety wise, I am feeling better. I’m more confident going about day to day things by myself – the school run has stopped being terrifying and gone back to being boring. I can go into supermarkets without having panic attacks or feeling sick and I think I might be able to face my more social activities like exercise classes again in the next few weeks. I am feeling positive about the future again and that feels massive. Even if I still need two naps a day to function as an adult.